Hannibal Missouri is located on the Mississippi and is a wonderful place to visit with family and friends. Most people associate Hannibal with Samuel Langhorne Clemens, known by his pen name Mark Twain, an American author and humorist. He is famous for writing the book The Adventures of Tom Sawyer. Plan on spending a weekend or several days to see all the historical landmarks in and surrounding this great midwestern river community. 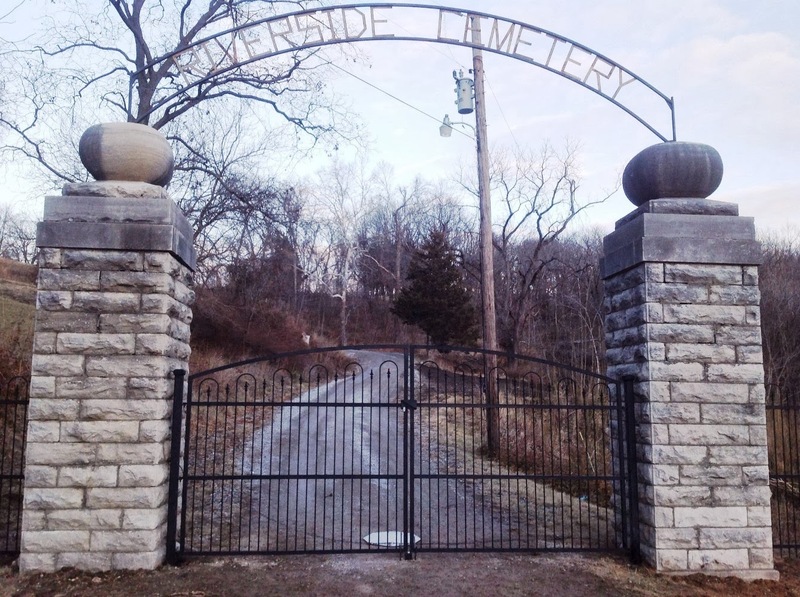 The Riverside Cemetery has a new driveway gate created by A Rustic Garden. The stone pillars are 100 years old so we designed the gate and side panels to coordinate. The gate raises to 8' tall in the middle with the side panels at 6' tall. Historical Hannibal Mo is where the author Samuel Langhorne Clemens, better known by his pen name Mark Twain, was an American author and humorist. He wrote The Adventures of Tom Sawyer. This area is a great place vacation with your family. 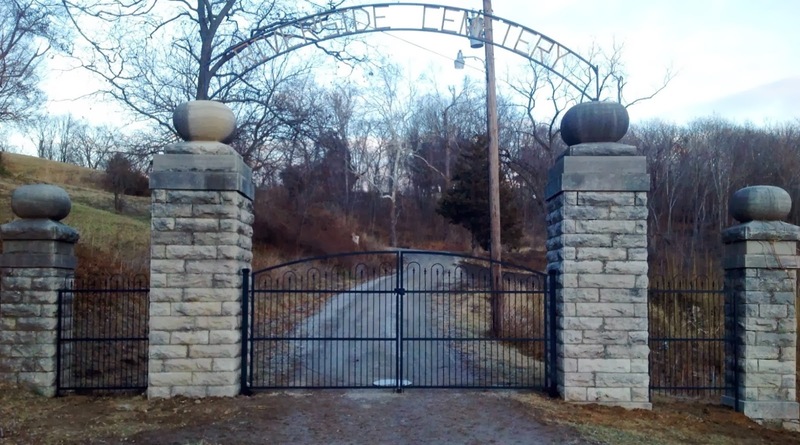 As you can see we made by hand this driveway gate that attaches to 100 year old pillars at the entrance to the Hannibal Riverside Cemetery. Notice the side panels made to fit the space between more pillars. The side fences are 6' tall and the gate is 8' tall in the middle. Every yard can benefit from a little art, and nothing graces a flower garden quite like welded metal sculptures of farm animals. And one of the finest specimens available is a friendly even-toed ungulate known only as Metal Mama Goat - Yard Art. She's roughly life sized, measuring 32 inches from nose to tail and standing 36 inches high at the tip of her horns. And she's remarkably realistic, complete with metallic udder, a long shaggy beard, dangling ears that look floppy despite their solid material, and round, gently curved horns that taper upward to a sharp point. Made of white painted metal, she looks just like a real goat with a white coat — even the black markings, created by weld burns, look natural. An irregular black dorsal line stretches along her spine from neck to tail, matching her black hoofs and horns and the dark markings around her eyes and nose. Though the beard is just a single flat metal panel, it appears to be made of individual hairs, thanks to further black markings that run along its length. Metal Mama's rustic charm makes her a welcome addition to almost any setting. The most typical placement is in a flower garden — you can position her in the middle of a bed, as if caught in the act of munching on some colorful blossoms, or place her in a walkway, as if wandering the garden paths. Few people think of decorating their vegetable gardens with statuary the way they do flowerbeds, but her mischievous presence would be just as appealing in a bed of squash or tomatoes. But don't restrict yourself to the garden — Metal Mama would look just as great anywhere in your yard, standing against a barn or house, or even inside your home. Just because it's welded metal art doesn't mean it has to be restricted to the outdoors! Made of recycled metal and crafted entirely by weld, Metal Mama Goat - Yard Art is a beautiful piece of country art. It's a blending between the world of sculpture and the farm experience, and at a price that won't put ya out to pasture! Metal bakers racks and shelving units are both decorative and functional, and make great additions to any home or garden area. Many bakers racks and shelving units are made with wrought iron, which has allowed the maker to easily weld the iron into beautiful pieces. The design of the wrought iron has given bakers racks and shelving units a rustic, Victorian, or antique style. Metal bakers racks shelving units are a perfect addition to any room or hallway in a home. In the kitchen, the racks and shelving can provide a convenient location to store decorative bowls, cooking or baking dishes, or jars of utensils. In the bathroom, the shelving units store rolled up towels beautifully. When placed in a hallway or entryway, metal bakers racks shelving units can hold keys or important documents. A variety of sizes can be found, which allows a metal bakers rack or shelving unit to fit in practically in any area of your home. Many metal bakers racks and shelving units are durable enough to be used outside the home. These racks will accent any landscape when placed beside a garden bench. They can be used to store clay pots or decorative boxes of garden tools and gloves. Tall units can be used for a more dramatic look, or small units can be used for a more discreet look. When placed beside your front door, visitors can enjoy seeing a fresh arrangement of flowers or a decorative welcome sign. Shelving units or bakers racks can be useful during many special occasions. Wedding floral arrangements can be placed in or on these units to add a unique touch to any outdoor or indoor wedding. They can also be decorated to match any wedding decor. Birthday presents and party favors can be display in an interesting way when stacked on shelving units. These are a creative and wonderful way to beautify your living areas. Depictions of animals in art have been around since prehistoric ages. Since ancient days, paintings in caves, on walls, and even on ceilings, there appear images of most any animal species known to man--and some of those that have become extinct. Some were hand-painted in dyes and paints, others drawn in charcoal; however, all served as a journal of sorts of everyday life for later generations to witness. However, once sculpting began being more defined as an art form in itself, the shift towards sculpting animal likenesses began. Transferring these images to a third dimensional perspective, the use of animals as subjects for statues enhanced and better portrayed the appearance the artist wanted to convey in a more dynamic manner. Previously, the images were lifelessly flat; however, now they had a real-life aspect to them forever edged in stone, clay or whatever the chosen medium might be. Combining animal statues & art in garden settings throughout Asia and Europe, a relaxed, peaceful and serene atmosphere was created. Now there existed a special place: a hiding place to meditate, exercise and even produce beauty and provision if need be. Since the late Middle Ages or Renaissance period, animal statutes have been popularly used to help depict the man known as St. Francis of Assisi. This famous monk and saint of the Christian religion is always seen accompanied by small animals at his side: doves, deer and squirrels to name a just few. Commonly known as the Patron Saint of Animals, this combination of saint and animals appears throughout thousands if not millions of garden settings in North America and Europe alike. Another use of animal statues can easily be seen in most any museum, public park or public square. No longer are animal statutes limited to stone, bronze, or copper materials to structure their artistic crafts of animals. Some cities opt for more modern sculptures of animals using contemporary sculpting materials such as fiberglass or even plastic. Whether etched in marble, bronze or just plain stone, animals and art are here with us for the long haul adding delicate charm and beauty to today's otherwise mundane and rather spartan-like existence. One thing is for sure, beautiful statues of animals are a great way to dress up any garden area. A gate is essentially the first doorway into your home. It opens to allow entrance and exit, and it latches to secure the area. However, a gate can also make a statement about what lies on the other side. Woven wire fence gates offer a practical solution to entry, exit and security, while leaving a rustic, romantic impression. Ornamental "loop top" wire fencing has an old-fashioned appeal that takes you back to Grandma and Grandpa's yard. The finial loops topping off the fence have a whimsical feel, while the sturdy woven wire secures lawn boundaries to keep children and family pets safe inside. Robust woven wire fencing and gates are also used around vegetable gardens to keep pets from digging holes and to protect the harvest from pilfering wild animals. This type of woven wire fencing is often placed inside a metal or iron frame to form a decorative gate. This style was especially popular in the 1920's and is making a comeback with antique collectors and homeowners with vintage taste. Symmetrical iron scroll work at the top of the gate, sometimes connected with a metal spire, is the classic way to make a functional fence gate more ornate. Despite the decorative quality, these metal gates are hardy enough to withstand pressure from rambunctious children and clambering canines alike. Most often, gates are associated with fences. However, freestanding woven wire gates also make ideal trellises. Ornate wire gates provide a classy, art deco flare to the yard or garden, where climbing plants can take root and prosper. First, secure the gate with re-bar or another kind of metal post. Then plant a rose, ivy, grapevine, morning glory or clematis at the base of the gate, and the plant will weave its tendrils through the wire and provide a little old-fashioned romance to the lawn. Woven wire fence gates can be found in all different shapes, sizes and levels of embellishment. They offer fencing and garden decor solutions that are long-lasting, both in construction and style. These old fashioned gates are the warm welcome mat you need too! Are you planning on something unique to put in your yard or garden? Perhaps you have seen a certain type of decoration in other people’s gardens and you wonder what they are and where they came from. Metal Garden Yard Art Balls Spheres, also known as Gazing Balls or Garden Globes, are unique additions to any yard or garden. They come in a wide variety of colors and vary in size from 2 to 22 inches in diameter with the average size of 12 inches in diameter. Not only are they just an ornament to enhance your landscape, they also have a fascinating history. Gazing Balls are one of the oldest known garden decor ornaments in history that date back as far as the 13th century in Venice, Italy. They have also been the subject of many myths and legends. Many people thought that having a gazing ball will bring prosperity and good luck to their homes and families as well as abundance to their gardens. Metal Garden Yard Art Balls Spheres were also placed near the door of the residence to keep away evil spirits. In the Victorian Era, they were given to people as gifts of true friendship and were given the name friendship balls. For families who had daughters that were dating, these delightful spheres were used to spy on the daughter and her suitor to make sure that they were behaving properly. Gazing balls were also used by servants of upper class homes and were placed right outside the dining room door on a pedestal. To see if the diners needed anything, the servants would glance at the reflection of the room in the ball right outside the doorway. Even though they are mostly used for decoration in today’s yards and gardens, gazing balls are still popular pieces of garden decor. Not only do they come in different colors and sizes, they are made from a variety of materials; from glass, to stainless steel to ceramic. They're sure to brighten your garden space and get the conversation flowing! One of the best ways for gardeners to improve the look of their gardens is to add accessories. When it comes to accessories, adding some Vintage Wooden Boxes from Bodine Electic is a great idea. These fabulous wooden boxes can be put to a wide number of uses inside your garden. They are lovely and stylish, and they add a touch of class to any garden setting. Here is a closer look at these fabulous wooden boxes as well as some ideas for how to use them. These incredibly gorgeous wooden boxes are salvaged from the Bodine Electric Company in Chicago, Illinois. The boxes were used to hold parts during their years in the factory. Because they were used in such a heavy-duty environment, they were constructed quite ruggedly to survive harsh treatment. The ends of the boxes are reinforced with attractive steel strapping that has been polished smooth over its decades of use in the factory. These boxes held up in the rough environment of the factory floor, which means they will have no problem surviving for several decades more in the comparatively mild garden environment. One of the best ways that gardeners can make use of these lovely vintage boxes is to turn them into planter trays. They are very large, which means that each box will be able to hold several plants. The small boxes measure 12.5 inches wide and 25 inches long. The large boxes are 18.5 inches wide and 25 inches in length. Whether homeowners want to place these boxes in their living rooms, window bays or front halls, they will look equally lovely. The classy look of the vintage construction of these boxes adds a touch of prestige to any environment. These boxes also make a lovely container to hold garden supplies. They can be placed both inside, outside, and in a shed to hold garden supplies. Their beauty and ruggedness ensures that these Vintage Wooden Boxes from Bodine Electic will look great no matter what area they are used in. Homeowners can make use of these fabulous vintage wooden boxes as outside plant trays as well. The boxes will need some special treatment when they are used in this manner. Gardeners need to make sure to give them an annual coat of varnish to protect them from the elements. In addition, the boxes should be brought inside during the winter in northern climates. This will prevent premature wear and tear due to the harsh weathering of winter snow and ice. Homeowners, gardeners and their friends will all enjoy buying these attractive and unique boxes. They are a great deal and make thoughtful gifts for plant lovers. Their ruggedness, beauty and refinement make them a smart purchase. Because they are a vintage product created from salvaged materials, buyers can feel good about their purchase from an environmental standpoint as well. Homeowners will enjoy using them in a wide range of garden scenarios. Americana is more popular than ever. Many look back to the days when cafes and truck-stop diners welcomed travelers on the long, lonely country highways. America also remembers pioneer days, when everyone worked on the farm and food came from the garden. Trade signs on barns and along highways told you where to stop. Americana is back in vogue with checked curtains, retro kitchen appliances and rustic decor. Those old trade signs are being collected, and rustic handmade signs are being made that revive the look. Whether you want to hang a piece of nostalgia for those long road trips, bring a little of the outdoors inside, or revive the Pop Art of the Sixties, 3 - D trade signs wall decor are a good way to do it. A "welcome" sign made of individual letters hammered out of recycled metal is more than a sign to come in. The bright-colored tin letters are a nostalgic bit of homemade Americana. Rustic "cafe" signs recreated in a loopily lettered font make visitors feel like they're sitting down on a country patio on a summer's day. Trade signs used to tell travelers what to expect. "Bar," "grill," "wine" or "music" could be had at that spot. These trade signs can be colorful and humorous additions to a kitchen or dining area at home. Guests become welcomed travelers. Stories are told as guests begin to reminisce. Using the style of a trade advertisement, a 3 - D lettered sign that reads "ove" or "friends" makes a reference to present company. Hostessing is easy when a big, rustic and rusted "eat" sign curls along the wall. Trade signs were big, so they could be seen. Replicas of originals can be just as big. Made from recycled old metal signs, the new wall art can stand out like a mural or a big Pop Art painting. The signs are cheerful and engaging. 3 - D trade signs wall decor reminds one of being out in the country, out on the road, off on vacation at a beach or the lake house. These signs take us back again.